Edit: Due to a mix up of days, I closed this a day earlier than I originally said. I'm sorry to those who missed out. I'll have another fun fabric giveaway in a couple weeks. I thought today would be a good day to share more Quilt Market loot. I have a signed copy of Inspired to Sew by Bari J. Ackerman to give away this week. Follow my blog and leave a comment telling your favorite summer cooking idea or recipe. We had marinated chicken kabobs on the grill last night with pearl onions, green peppers and grape tomatoes. We loved them, but it made me realize I need some new yummy summer food ideas. 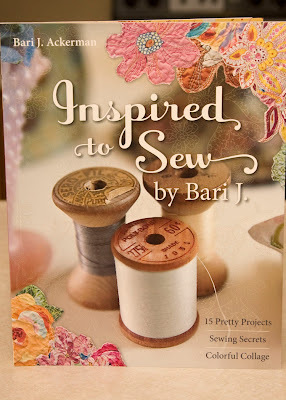 Blog about this giveaway and leave a second comment with the link to your blog post. Have a great week! I'll announce the randomly picked winner on Friday, June 10th. In summer we love Oven roasted roma tomatoes with couscous and basil pesto. Yummo! We love this teriyaki marinade that can be used for chicken, steak, shrimp, etc. We love love love it and it means summer is here!! It's chicken salad for us! We use a roasted chicken, taking off all the meat, and have it in a green salad with fresh mango chunks and finely chopped red chilli. We use olive oil, rice wine vinegar for the dressing. Yum. Light, fruity, summery with a little kick. Our favorite summer dish is an incredibly delish pearl barley salad... I can email you the recipe if you want! We like vegies on the grill. Chop up vegies put a little olive oil and seasonings on them, then wrap them up in heavy duty foil. Put them on the grill with the main course. I follow your blog in my google reader account. I'll be checking back here for some recipe inspiration! I really like this recipe from The Pioneer Woman for Tequila Lime Chicken. (I didn't use tequila because I'm not about to buy a bottle of liquor for a recipe!) It's very good and simple. I need to make it again! We eat a lot of quiches in the summer and salad made from whatever is available in the garden! I just found an already cooked brisket at Costco that I love. All you have to do is warm it up in the microwave and it takes wonderful. No cooking is the best part. I already follow your blog and am excited about your giveaway. I'm off to blog about it now. Last night we made apple-cinnamon pull apart rolls. Baked like a gnarly loaf. Roll dinner roll dough in butter, then cinnamon/sugar. Plop in pan. "Sprinkle" cooked apple often.Let it rise a bit. Bake at 350 for 30-40 minutes. Don't overfill the pan though. Some balls fell out of the pan as it rose in the oven and cooked on the racks. Turn upside down after cooling 10 minutes. Oooh! I love making salads during the summer. I love Mexican Chicken Salad! We are having our coldest Winter day today so I can't even imagine summer food let alone suggest something! Great giveaway though! One of my fave, quick grilling recipes is roasted veggies. Just put onions, potatoes, pepper, whatever you want to add in Thd center of a foil square. Drizzle with olive oil and salt/pepper and herbs. Fold so that each packet is air tight and grill along with your meat. Yummy and fast with little prep. I follow you, and I think my favorite thing in the summer is potato salad and burgers. Can't be beat! pineapple, celery, onions, grapes, and cranberries. mayonnaise. Pour over salad and toss to coat. before serving, stir in cashews. I love following your blog.. fav recipe, grilled veggies on the barbq. I already follow your blog. And my favorite summertime meal is one made by my husband who's the cook in our family. He grills an awesome beer can chicken! My favorite summer recipe is cut up tomatoes, onions, and cucumbers add to bowl. Pour Garlic Expressions over the top and let sit in fridge for a couple of hours. Super yummy!!! In case you don't know what Garlic Expressions are here is a website... http://www.garlicspecialties.com/ But you can find it in some grocery stores. We try to grill as much as possible in the summer to keep the heat out of the kitchen, trying new marinades I find online for chicken. ALso keep using the crock pot , love to make baked beans to go with the grilled foods. Grilled fruit is great, use one of those wire pans for the small pieces. I'm already a follower too. Summer to me is not cooking.....we don't have air conditioning so do as little as possible to heat up the house. so its fresh stuff from the garden, with maybe some chicken thrown in or some bacon or cheese. Can't wait for those first home grown tomatoes! 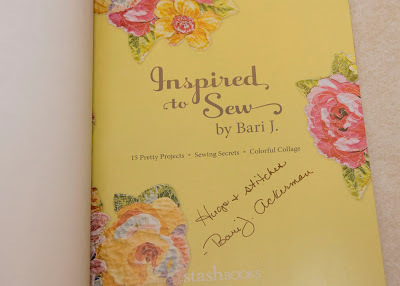 Happy sewing and thanks for a chance to win Barb's new book. My guys love pulled pork with coleslaw. I cook it in the crock pot so oven doesn't heat up the kitchen. I also make ribs in the crock pot. Of course the kids would be happy eating hot dogs and burgers on the grill all summer. My fav summer recipe is easy. You cut up some potatos, add an onion or two (cut up), and some garlic/garlic salt/garlic powder) put on the grill in foil with the other food you are cooking out there and let it set for about 25 min on the grill. It will cook and let all the good flavors marinade for a while. Take out, let it cool for a bit and then enjoy! No extra heating of the house since you already have the grill going! I do love fresh tomatoes with mozzarella and basil and olive oil. Yumm! Summer - marinated portabella mushrooms on whole wheat buns - tomatoes slices and fresh basil! Homemade strawberry lemonade is always fun too! thanks! I follow you. And my favorite side dish for summer is Mexican Corn Salad...yummy and fresh with a taste of cumin. Nice give away and for a book I haven't bought yet (rare)! I know it might sound crazy but I like using the crock-pot as much as the grill in the summer - doesn't heat the house up at all! Throw a couple chicken breasts in on low for about 4 hours, then shred and add your favorite bbq sauce. We serve with blue cheese coleslaw (pre-shredded slaw with blue cheese dressing and crumbles to taste) on toasted buns for a YUMMY sandwich. I follow your blog. A simple summer dish for our family is peeled, sliced cucumbers in apple cider vinegar with fresh dill. My mother's "just picked this morning" burpless cukes are the best! Thanks for the giveaway. Simple as can be. Smokies and salad. Yum.